ROG Swift PG27VQ is a 27-inch curved gaming monitor with WQHD (2560 x 1440) resolution. The 1800R panel curvature ensures every point on the display is equidistant to your eyes, so you get a comfortable viewing experience even during marathon gaming sessions. NVIDIA G-SYNC technology that combine to eliminate lag and motion blur, ensuring visuals that are free from tearing. This means you'll have the upper-hand in fast-paced first-person shooter, racing, real-time strategy and sports games. ASUS ROG Swift PG27VQ is the fastest in its class, with a rapid 1ms gray-to-gray response time that banishes smearing and motion blur. It is especially useful in fast-paced games — so you can take corners like a pro racing driver or make that impossible headshot with ease! 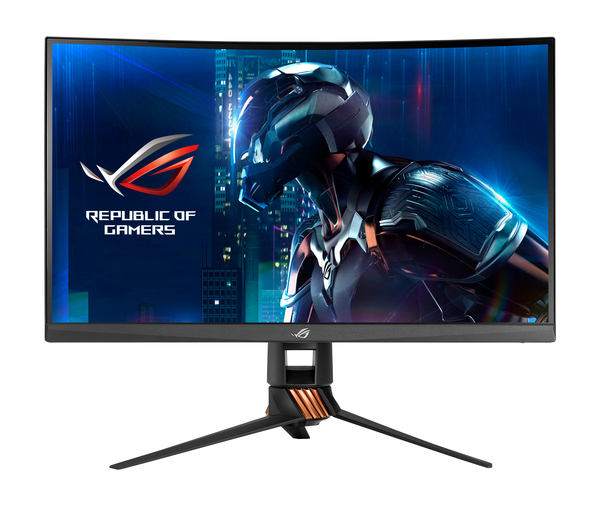 Swift PG27VQ is the first ROG monitor with ASUS Aura Sync lighting technology. This provides ambient lighting on the back of the monitor that can be synchronized with connected Aura-enabled components and peripherals. To achieve perfect synchronization, install Aura software onto your laptop or desktop and connect ROG Swift PG27VQ with other peripherals, resulting in a cool and stylish backdrop to any gaming setup. It also allows the lighting to pulse to the beat of music or games!